Helping people PUSH past their pain to find their purpose. 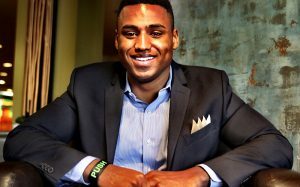 John Gaines aka “John PUSH Gaines” is a former at-risk kid turned youth advocate. John has spoken at universities, nonprofit organizations, youth conferences, NBA skill camps, churches and schools. He has worked with groups of parents, educators, coaches & mental health professionals. John’s ultimate goal is to help as many young people as possible and to help them realize regardless of the adversity or obstacles they may face, they can still PUSH to be the great human being that they were created to be. John attended East Central University where he graduated Outstanding Student in Business and won a football championship as captain of the football team! In addition, he graduated from Liberty University with a Master degree in Business Leadership and he is currently pursuing his Doctorate degree in Business Administration. Helping students PUSH past their pain to overcome learning and social obstacles, find their purpose and follow their dreams. In this engaging talk, discusses his personal struggles and trials of overcoming his inability to read and write. John covers his tough road to doctoral academia, a career with a Fortune 500 company, winning a college football championship and his cameo on Wall Street during the New York Stock Exchange. He provides practical tips to the audience about perseverance, and a step-by-step guide to achieving one’s dream. The purpose of this lesson is to help students realize the importance of a healthy self-image for success in life. This lesson will help students understand that they have VALUE and that we all have the potential to be great despite the obstacles that we face. The purpose of this lesson is to give students confidence, that they know the right choices to make already, and to challenge them to have the self-discipline to follow through with those choices. This lesson will focus on developing a winning mentality to help students win in the classroom and in life. "John is an exceptional speaker for anyone who is interested in hearing an incredibly authentic story of perseverance. His message resonates with everyone and leaves a lasting impression on the audience. His message topics include the power of dreams, living up to your potential, living with no regrets, and never giving up. His life obstacles and challenges allow him to speak from a position of - I have been there! John’s message left me with the same feeling that I felt when I heard Jim Valvono's 1993 ESPY speech. Never, never, never give up!" "John spoke at our school of 980 students in the Spring of 2013 on our yearly Diversity Day. His message on Pushing for your dreams left an impact on our students. John's candor about his life struggles and overcoming them inspired students. He is truly making a difference in today's youth." "Thank you John for coming out here to CMC and sharing your story with our team, I've heard nothing but positive things about you being here and doing your presentation. I'm working on setting up something so you can come back and share with the entire team. " "The message I received from the speech was to always P.U.S.H no matter what the circumstances are. Also, if you do not believe in yourself or you feel like you can't accomplish something, just imagine yourself doing it for a minute. If you can do it for a minute, you will able to do it for the rest of your life." "The speakers from P.U.S.H. taught me to never stop believing in my goal and never stop trying to reach it no matter what. PUSH for your goals. My PUSH is to Practice, Pray and Prosper until something happens. I will PUSH for everything in life. Whether it's getting good grades or reaching my goal to be in the NBA or to become a doctor. "